Edwin is a senior at Redmond High School and the current chair of the Mayoral Internship. He has a passion for civic engagement and hopes to one day join the US Senate to create meaningful changes in the lives of all Americans. He also likes to play Smash Bros. in his free time. Sahas is a senior at Redmond High School who is interested in either going into finance or economics for college. In his spare time, Sahas enjoys tutoring for the SAT/ACT or playing basketball. As well as tutoring, Sahas runs multiple communities to help students nationwide prepare for standardized testing—one for the SAT with 2100 members and one for the ACT with 2700 members. At Pathway, Sahas is a part of the AIF team working on social media and website development. Megan Lu is senior in the Gifted Program at Interlake High School. 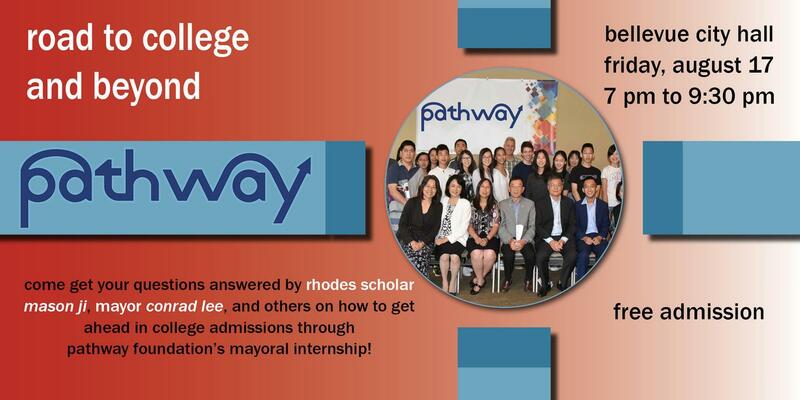 In the Mayoral Internship, she was previously the website development lead, and is currently working on a data analytics project for PATH. Prannay Pradeep is currently a senior at Interlake High School. Prannay has been a dedicated member of the American Immigration Forums for three years and enjoys collaborating with his peers to engage the public in immigration based dialogue. On November 18, 2018 Prannay got a new dog named Wilson; he enjoys playing with it in his free time. Caleb is currently a senior at Interlake High School. He has been a member of the American Immigration Forums for three years and loves hanging out/working with the other AIF members. He enjoys filmmaking and playing tennis in his free time. Ethan is currently a senior at Interlake High School. Ethan is a passionate member of the American Creed group and works specifically on survey development and discussion forum planning. In his free time, Ethan enjoys swimming and hanging out with his friends. Muhan Zhang is a junior at Interlake High School. At Pathway, she helps the American Creed Project with social media/outreach and behind-the-scenes planning. In her free time, she loves to participate in Model United Nations, shop, and play badminton! Alex Tanimoto is currently a sophomore at Interlake High School. This is his first year in the Mayoral Internship Program. He is in the American Immigration Forums project and is a decent follower of immigration news. Outside of the Mayoral Internship, Alex enjoys computer science and swimming. He also does robotics and DECA as extracurricular clubs. His dream is to become an entrepreneur of a major tech company. Erik Ma is a freshman in the gifted program at Interlake High School. He is very passionate about helping others and the community and enjoys music and movies. He is currently a member of the Digital Platform team inside of the Mayoral Internship. Sarah is a freshman at Lakeside Upper School. She is part of the American Creed project and enjoys gymnastics, painting, and piano. Liana Wu is currently a senior at Newport High School and is co-leading the Blog and Media project. She enjoys collaborating with other projects to raise awareness and encourage civic engagement within the community. In her free time, she can be found checking out all the books in the library, tutoring munchkins, and smashing ping pong balls. Richard is currently a sophmore at Newport High School. He is hoping to make a positive impact on the community and express his ideas through the pathway foundation. His hobbies include sports and video games. He is a part of the American Creed Project. Andrew is a senior at Newport High School. He loves working with others to promote civic engagement and is also very interested in technology. In his free time, he likes to play tennis and hang out with friends. He is a part of the American Immigration Forums. Aaron is currently a sophomore at Newport High School. This will be Aaron’s first year in the Mayoral Internship and he is an active member of the Speech and Debate Club and DECA. On the side, he enjoys swimming and is an avid reader. George Wang is currently a senior at Newport High School. His hobbies consist of playing badminton, messing with computers, playing violin, and reading books. He has been playing badminton since middle school and has participated on some teams and gone to the bellevue badminton club. He doesn’t play in a orchestra right now but he has played for school orchestras and BYSO. His favorite book since elementary school is Inkheart. He really hopes that he can learn a lot from participating in Pathway and hopes that he can expand his perspective as well as his knowledge on current world events as well as becoming more involved with civic engagement. David Shen is a junior at Issaquah High School. He’s responsible for the leadership over the Digital Platform, and spends his spare time whenever possible in Robotics, and on video games. I’m responsible for establishing an educational forum that will help foster greater civic engagement by parents of school districts. As a second-generation Chinese immigrant, I’m passionate about increasing the political participation of a mainly silenced Asian population, I wish to give voice to those who need it. Gloria Shen is currently a 10th grader at Inglemoor High School. She is part of the PATH Outreach project and hopes to continue raising awareness for PATH and creating connections within the community. In her free time, she is the PR Officer for Inglemoor’s Science Olympiad team and does ballet. Rina Li is a junior at Mercer Island High School. She is currently a member of the American Immigration Forums inside of the Mayoral Internship. She helps with surveys and behind-the-scenes planning. In her free time, she enjoys to debate and to swim. Danny Lin is soon to be junior at Bellevue High School. He is an avid golfer and is excited to be participating in Conrad’s mayoral internship program. Amanda Ong is currently a sophomore attending Bellevue High School, where she is an active member in Speech & Debate and DECA. She enjoys spending time with her family and friends, practicing the violin and piano, and traveling! Her passions include public speaking and helping the community. This is her first year with the American Immigration Forum, and she is very excited to be a part of such a thrilling event. Shaoqi Wang is a junior at Bellevue High School. She is passionate about community volunteering and the Bellevue Mayoral Internship. She is currently in the Blog and Media Project. Yu Xi is currently a senior at Bellevue High School. In her free time, she likes to play piano and basketball. She is passionate about her Chinese identity and culture, so she has founded the Chinese club at her school. For this internship, she is working on the Blog and Media project. Melissa Lin is a freshman at the Overlake School in Redmond. She is currently co-leading the Media and Blog Project and is excited to make a difference through the Bellevue Mayoral Internship program. In her free time, Melissa enjoys reading. Rock is a sophomore at the University of Washington planning to major in finance. He entered UW through the UW Academy program following his sophomore year of high school. Rock enjoys doing consulting work and reading during his spare time. He is a part of the PATH Outreach team.